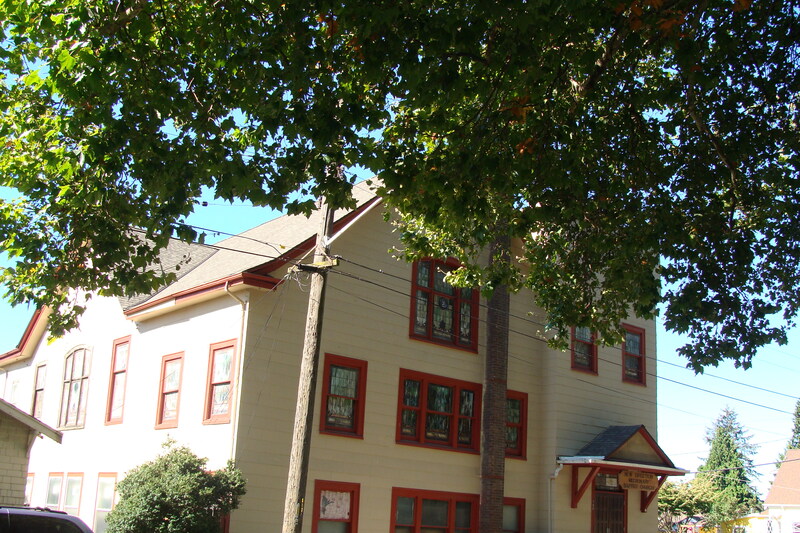 Based on field work conducted in September 2014, this historic property retains its relationship to the streetscape, historic building form and a sufficient amount of exterior historic building fabric (design features, cladding and/or window sash/openings) to contribute to the distinct character of the Georgetown neighborhood. This is a generally well-preserved historic property that appears to possess architectural and/or historic significance. This property has been rehabilitated, is well maintained and exhibits no substantive changes to the exterior appearance/desig character since it was identified in the 1997 HRI project. (1997) This property is associated with the residential and commercial building boom in Georgetown which occurred between 1890 and 1916. 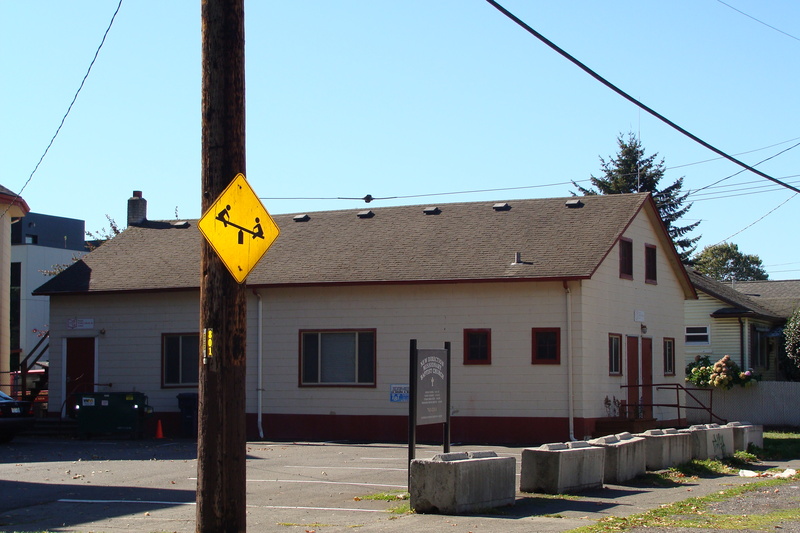 Fueled by the construction of the Seattle Brewing and Malting Company’s new brewing facility after the turn of the century and the arrival of foreign immigrants, especially German and Italian, Georgetown came to rely more on its commercial and industrial bases rather than agricultural. With the increase of industry and business, Georgetown had grown in population from 1,913 in 1900 to approximately 7,000 by 1910 as families located themselves near its factories and other places of employment. 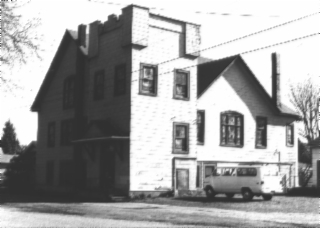 The original Georgetown Presbyterian Church, a single front gable one-story form constructed c. 1902-1903, was established as a mission church and was situated elsewhere on this site (see Seattle P-I photograph, 1/14/1906, pg 12, cols. 2-3) . The origin of the design and construction of this second church is not known. 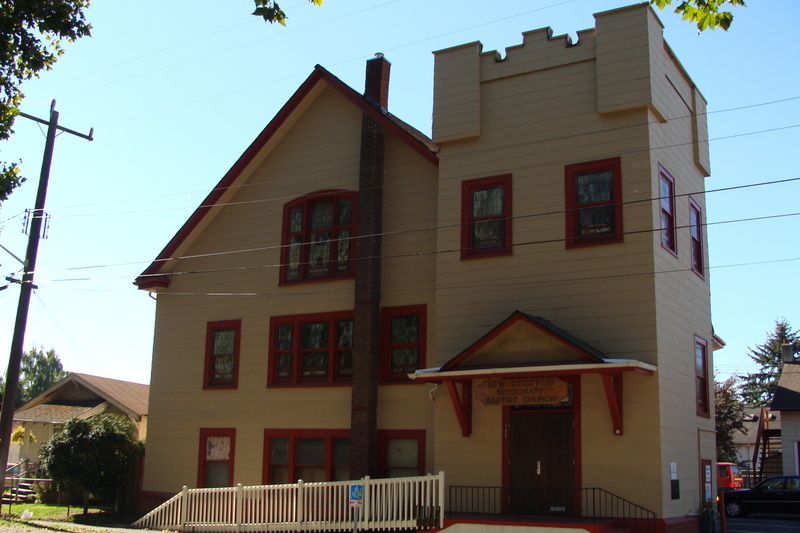 The church was dedicated in June of 1912 (see Seattle P-I article, 6/10/1912, pg 2, col. 5) and ceased to be a mission church at this time. However, original permits were not located, and the project was most likely begun prior to the Georgetown annexation in 1910. The church includes particularly distinctive leaded and painted art glass windows and is worthy of in-depth research. 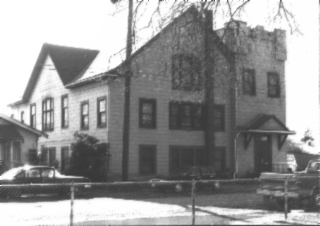 The adjacent annex building was moved to the site in 1949 from the corner of Corson Avenue and Michigan Street, property previously associated with the county hospital. It is not known what association the annex building may have had with the hospital operation and complex. A noteworthy, however deteriorated, example of early 20th C. ecclesiastical design. Exhibits an eclectic mix of popular ecclesiastical design modes drawn from Gothic, Tudor, and Colonial Revival styles. 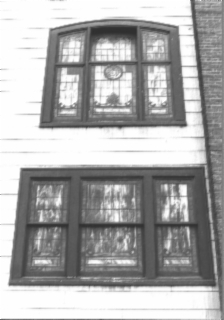 Distinguished by the following design features and intact historic building fabric: an irregular, asymmetrical floor plan with an offset entrance and a 17’ x17’ facade tower capped with castellations, prominent front and cross gables, an extensive amount of ornate leaded/stained (and painted) art glass throughout main floor level and visible on three elevations, original window trim and surrounds, and an entry doorway accentuated by a pedimented hood supported by kneebraces. 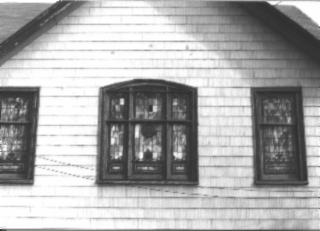 Windows are typically double-hung and segmental arched (focal at each gable end). The original narrow clapboard cladding is currently covered by asbestos shingle siding. Portions of the castellations have been removed. 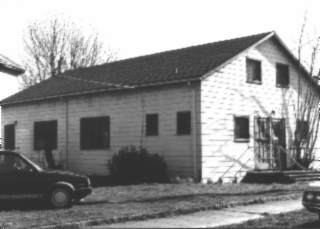 A 30’ x 50’ church-related building has been situated on the site since it was moved there in 1949. It is a simple one and one-half story wood frame structure with a front gable form accentuated by vertical six panel doors and multi-pane steel window sash. The current condition of the interior or the presence of character defining interior features is not known.